I have happily been reading the novels in the Forgotten Realms campaign series “The Sundering”. The first, by Salvatore who is familiar to me was okay (still my least liked of the series, though adequate), but the books that followed captivated my attention more and more, culminating in the previous book “The Adversary” by Erin M Evans. The fourth volume, “The Reaver” lies somewhere in between the others in terms of personal appreciation and enjoyment, but it does have notable strengths over the others for anyone new to the series or to Forgotten Realms. 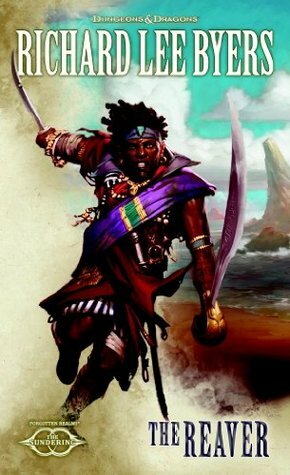 Firstly, “The Reaver” works best as a stand-alone story requiring little familiarity with the campaign setting; with no basis (that I know of) on existing characters or series by Byers there is also no period of adjustment to this novel, unlike the others which are each continuing adventures of existing casts. While further tales with these characters is of course possible, Byers does the best job so far of making this a story unto its own rather than a secondary side excursion to bridge one set of novels to another. Secondly, “The Reaver” is stylistically simple, an exciting fantasy adventure, no more no less. Simple isn’t meant as disparaging (though I do prefer the style and complexity of a story like Evans’ novel). Some people want nothing more than a great adventure to read. And Byers delivers that. At first I thought this novel would be a bit too simple, and I wasn’t convinced at the start by Byers’ writing or plotting, which just seemed average to me. Happily though I found my appreciation for the story and for Byers’ style to grow as the novel continued. Sharing many of the strengths at writing these kinds of novels as Salvatore has, Byers work comes off as far less cartoonish despite featuring godlike characters.